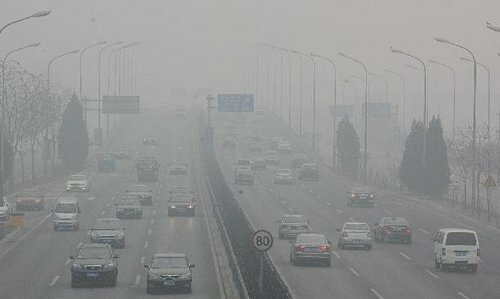 China announced its toughest ever measures to combat air pollution on Thursday, in a new action plan. The plan aims to cut China's total coal consumption to below 65 percent of its total primary energy use by 2017, which is part of the country's efforts to accelerate adjusting its energy structure and increase clean energy supply. New projects set to be constructed in the Beijing-Tianjin-Hebei region and both the Yangtze Delta and the Pearl River Delta regions will be banned from setting up their own coal-fired power plants, it says. By 2017, the total capacity of China's nuclear power reactors in operation will reach 50 million kilowatts, and the share of non-fossil fuel energy will be raised to 13 percent in overall primary energy use, it adds. Under the plan, the country is also eyeing a roughly 20-percent cut in energy consumption per unit of industrial value added by 2017, compared to 2012. The government said combined heat and power plants will gradually replace decentralized coal-fired boilers in industry clusters of chemical engineering, papermaking, dyeing and tanning for the sake of emissions cuts. China will quicken construction of desulfurization, denitrification and dedusting facilities in coal-fired plants, steel mills and cement plants, it added. The plan calls for technological upgrades at refinery enterprises to improve the quality of fuel oil, which affects vehicle emissions. The government aims to clear heavy-polluting "yellow-label" vehicles from roads across the country by 2017. As part of a broader air pollution campaign, China will promote the transformation and upgrading of industries, and further tighten control over high-polluting and energy-intensive industries. Greater efforts will be made to eliminate outdated production capacity in the sectors of iron and steel, cement, electrolytic aluminum and flat glass, the plan says. And heavier penalties will be imposed for violations of environmental, energy conservation and safety requirements, while energy conservation and environmental protection standards will be strictly implemented to support the phasing out of excess production capacity.